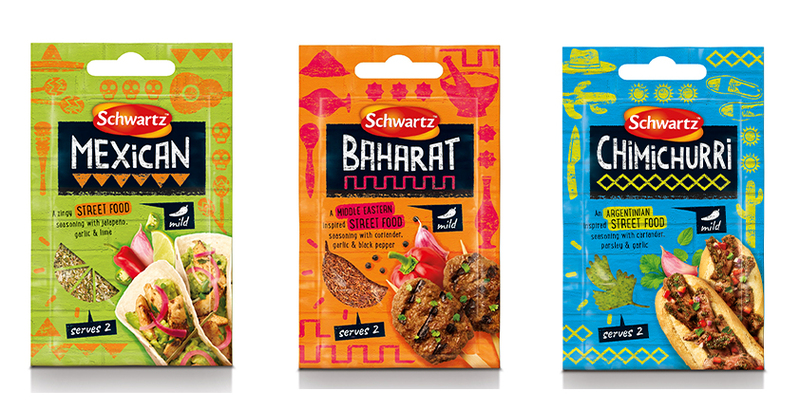 02 Aug 2018 --- Schwartz has launched a new Street Food Seasonings range in response to the growing consumer trend for world foods. The UK, in particular, has seen a rise in popularity of street food markets, where consumers enjoy on-the-go, versatile and authentic world flavors. Matched with their audience’s desires to recreate recipes from scratch at home, this new series of seasonings is the perfect fix for adventurous millennials seeking quick, easy and tasty meal ideas. Today’s connected world creates an opportunity for new ethnic flavors, street food inspired meals and the revival of culinary classics. Innova Market Insights has reported an average annual growth of 20 percent in food and beverage launches with global flavors (Global, 2013-2017), with growth in platforms such as chili, herb and floral flavors. In 2017, 23 percent of the new product launches tracked with an ethnic flavor were private label brands relative to 19 percent in 2013. NPD based on world flavor ranges have become increasingly popular and food truck and street food flavors have been a source of inspiration for NPD for retail. According to Innova Market Insight data, there has been a 24 percent growth in F&B launches with a food truck or street food claim (Global, 2017 vs. 2016). As the population becomes more diverse, consumers are embracing bold flavors, which were once unfamiliar. Consumers are seeking intense experiences with flavor combinations that challenge the normal level of spiciness. For example, the average annual growth of food and beverage launches with selected chili flavor (Global, 2013-2017) is +59 percent Sriracha chili, +19 percent Habanero chili and +15 percent Chipotle chili. At this year’s IFT, in Chicago (July 16-18), Innova Market Insights presented their ethnic flavors trends, amongst others, at their Taste the Trend pavilion. You can read more on this here. “Millennials travel extensively, be it on their gap years or backpacking holidays, and we know they are first in line when it comes to experimenting and discovering new things. Food is a big part of the experience they want to bring back home,” he explains. Yes, it’s clear to us that restaurants, food trucks and festivals are capitalizing on the trend for world foods. However, we know that these flavors are often quite hard to recreate at home,” Yates adds. Launching in all major retailers across the UK this summer, the convenient, single-use sachets enable consumers to cook more adventurously at home with confidence. These seasonings are made using the best quality ingredients – the Schwartz trademark – and, with its 100-year heritage, the brand has the ability to create flavors at an accessible price point of RRP £0.99 (US$1.30), giving retailers a chance to capitalize on their customers’ curiosity. Baharat – A Middle Eastern inspired mix of coriander, garlic and black pepper, suited to make easy lamb koftas, marinated chicken or spiced chickpea salads. Caribbean Jerk – A blend of allspice, pineapple and chilies, best enjoyed sprinkled over hot, roasted chicken wings or mixed as a marinade for king prawns or salmon. Chimichurri – An Argentinian-inspired seasoning with coriander, parsley and garlic, perfect for marinades and sliced steak sandwiches. Mexican – A mix of jalapeño, garlic and lime. Mash into ripe avocados for an easy guacamole fix, or use to coat king prawns and sliced chicken for a classic Mexican wrap. Sriracha – A spicy Thai-inspired seasoning with chilies and garlic. Sprinkle over chicken, pork or prawns or stir into mayo for a dip with a kick. 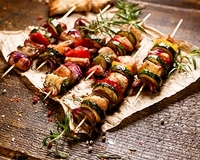 Schwartz has utilized its Flavour Forecast to identify the leading edge flavors consumers want to try and these new tastes hit the mark when it comes to contemporary street food recipes. This underlines the brand’s reputation as an expert in understanding and delivering amazing flavors while the new, modern and colorful sachet designs reflect authentic ingredients, and adventure, perfectly catering to the always-curious millennial consumer palate. “Our Flavour Forecast for 2018 identifies a number of potential future trends – we anticipate that we will see a movement towards East African, Japanese Izakaya and Venezuelan cuisine, amongst others,” Yates reveals. “Ingredients such yuzu citrus, Furikake (seaweed and sesame based seasoning) and Sansho Pepper are already appearing on menus which means it’s only a matter of time before people will want to use them in their homes,” he concludes.